I want to apologize in advance if these pictures look a little blurry and I look a little wind struck. I shot this outfit on Easter and that day was SUPER windy. I made the best out of this shoot and got a few good looks but the rest pretty much look like I was standing in the middle of a storm with a cute floral blazer. Haha! I almost didn't want to post these pictures but this blazer was just too cute to not share with you guys. I got this blazer from Moddeals last month and unfortunately it's sold out on their site. I will link a similar one below for you guys. 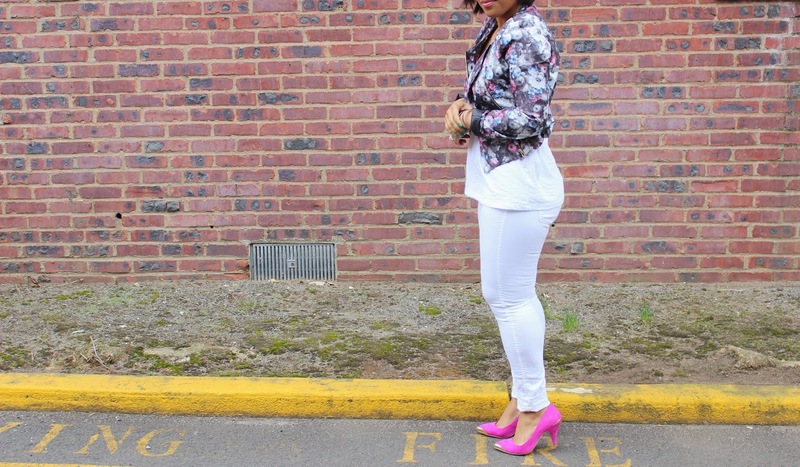 I been looking for a floral blazer for a while and just never got to finding one I liked. I was pretty excited when I found this one. I paired it with an all white look and these pastel pink heels. When I think of Easter I always think of pastel colors so I knew I wanted to wear a little pastel in my outfit. The all white made the blazer popped which is what I wanted. I definitely want to re-style this blazer soon and hopefully on a non windy day! I hope you guys have a fun Fri-yah and a awesome weekend! That blazer is super cute!